Pearl Bag: Tangerine with Chocolate lining. Amy Butler Sweet Life Bag made from Amy's August Fields Home Decor Fabric. 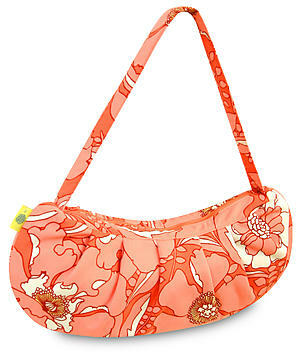 Amy's versatile Pearl Bag is both stylish and practical, with great secret pockets for stashing tools. A unique zippered inner pocket creates a divider that allows for organizing more than one project. Inside the bag are three pleated pockets along one side.